The Bat.-Châtillon 12 t is a French tier 8 light tank. A light tank developed by Batignolles-Châtillon in the late 1940s. The vehicle featured an oscillating turret and 75-mm gun. Never saw mass production. The only tank in French LT line that's not AMX series, this tank doesn't share its equipment with other French tanks so you have to research everything from scratch. However, its play style is the same as most of the AMX LT series. Abbreviated in-game as "B-C 12 t". The Bat.-Châtillon 12 t leads to the Bat.-Châtillon 25 t AP, the AMX 30 1er prototype, and the AMX 13 90. Unlocks 3 vehicles: AMX 13 90, AMX 30 1er and the Bat.-Châtillon 25 t AP. The BatChat 12t features a fast-firing, low burst autoloader on a highly mobile chassis with effective camouflage and workable gun handling. This creates a platform which is good for passive scouting, flanking and firing from ambush. Engagements should not occur from long range, as the gun is unreliable enough that you can miss entire clips due to poor aim, and the damage output is too mediocre to punish exposed enemies. Instead, the player should keep at a distance where they can spot the enemy without being spotted in return (~300-400m) and fire from cover. When distracted or low health targets present themselves, the BatChat 12t makes for an effective flanker and assassin. However, it should not be used in a brawl. The tank is arguably one of the worst tier 8 light tanks, being inferior in almost every aspect (firepower, armour, mobility) in exchange for an autoloader, smaller profile and better camo. Thanks to the incredible camouflage values of this tank, it saw extensive use as the tier 8 of choice in the 7/68 format battles of the WGL Grand Finals. The two defining aspects of the BC12t are its autoloader and its exceptional camouflage and builds should focus on optimizing these two aspects. All crew should be trained with camouflage and the commander should have 6th sense in order to optimize for the passive scouting role. Further improvements for the scouting role would include recon on the commander. For the gunner, either snapshot or dead-eye are good choices. The driver should learn smooth ride to give the BSC12t at least a chance to hit targets while moving. The BatChat can mount common equipment pieces such as vertical stabilizers, optics and vents. However, a camo net should be considered as it boosts the camo when stationary to up to 50%. 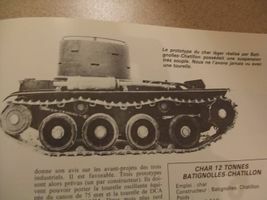 The Bat.-Châtillon 12t, or the Char 12 Tonnes Batignolles-Châtillon, was a prototype French light tank. Further requirements came in later. In January 1947, it was decided that the new tank must be able to accommodate many different types of weapons, and soon after the decision to use an oscillating turret was made - specifically, the FL-4 turret made by the Fives-Lille company with a high-velocity 75mm gun. By the end of 1945, the requirement that the tank must be air transportable was dropped. One should note that these statistics are either planned or tested a dummy turret. There are no known images of the Bat-Chat 12t with a proper turret, and it is unknown if the prototype was ever fitted with one. The AMX prototypes won the competition with 5 prototypes built by December 1949, and entered service in 1952 as the AMX-13. In contrast, Batignolles-Châtillon's tank was not ready to be shown until June 1950. With the AMX prototype having been declared the winner, all development on and experiments with the Bat-Chat 12t ceased by September 1951. Only known image of the Bat-Chat 12T prototype. The tank has a completely different suspension. The Bat-Chat's gun, the Canon de 75 mm Vo 1000 m/s, was an earlier version of the 75 mm SA50 used by the AMX 13. Despite that, the SA50 vastly underperforms compared to its prototype version. The in-game Bat-Chat 12t is based on the Bat-Chat anti-aircraft tank 12t,an anti-aircraft tank without oscillating turret and equipped with 4 automatic 30 mm cannons. This page was last modified on 3 February 2019, at 20:09. This page has been accessed 36,649 times.